Developing the resource potential and transport capacity of the Russian sector of the Arctic requires huge foreign investments and the involvement of the world’s largest companies. The Arctic zone is extremely rich in mineral, hydrocarbon and biological resources. The U.S. Geological Survey states the “extensive Arctic continental shelves may constitute the geographically largest unexplored prospective area for petroleum remaining on Earth.” The survey also estimates that the Arctic holds 30 percent of the world’s natural gas and 13 percent of its oil. Most of the resources in the area are under the control of the Arctic coastal states. The 1982 U.N. Convention on the Law of the Sea assigned Denmark, Canada, Norway and Russia part of the Arctic shelf and an ex­clusive economic zone extending 200 nautical miles from their borders. No country outside the Arctic officially denies the legal rights of the Arctic coastal states, yet neither do such countries readily accept the current state of affairs. To speak out against the legal status of the Arctic space would be tantamount to calling for a revision of current international maritime law, the regime of the high seas and other universally recognized norms of international law. Although non-Arctic states have not published any official documents about their strategy in respect to the Arctic, it does not mean that no such strategy exists. 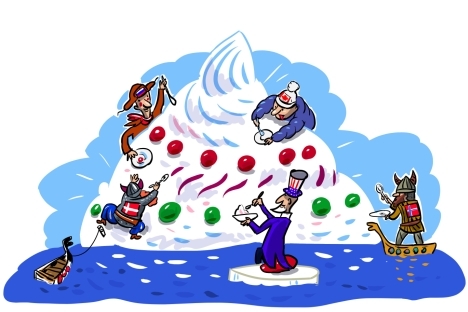 Rather, preference is given to diplomatic maneuvering, with a view to adopting indirect measures that could eventually lead to a change in the legal status of the Arctic space, allowing non-Arctic countries to gain a slice of the Arctic resource pie. This objective lies behind the rationale put forward by expert circles and the media for an international treaty on the Arctic, similar to the Antarctic Treaty, but this ignores the fundamental differences between the unpopulated ice-covered continent and the vast expanses of open sea in the Arctic Ocean with terrestrial areas that are home to citizens of individual countries. Proposals have also been put forward to transform the Arctic Council — which operates as a consensus forum for high-level cooperation among the Arctic states and organizations of indigenous peoples — into an international intergovernmental organization. The creation of such an organization requires equal participation on the part of all Arctic and non-Arctic member states in governing the affairs of the region. Citing the global significance of the flora and fauna of the Arctic, they insist upon the establishment of a set of mechanisms for international Arctic governance, but proposals on the creation of similar mechanisms of international governance for the Pacific or the Atlantic, for instance, are not forthcoming. The initiators of these proposals strive to create the impression that the Arctic coastal states cannot manage the region responsibly by themselves, which does not correspond to reality. These diplomatic maneuvers have not met with great success, but that has not put a stop to them. Stronger cooperation between the Arctic states will narrow the available room for such maneuvering. Developing the resource potential and transport capacity of the Russian sector of the Arctic requires huge investments that Russia alone cannot afford to make within a reasonable time frame. The involvement of the world’s largest companies in resolving these issues will assist Russia’s social and economic development and unlock its resource and transit potential for the benefit of the world economy. There is no viable alternative. Lev Voronkov is a research fellow at the Nordic and Baltic Research Center at the Moscow State Institute of International Relations.